To track down Free Range, you may be wise to check their Instagram first—the roving food truck bounces between Stumptown Coffee Roasters, Coffee Commissary and a few other locations. The truck specializes, of course, in free range chicken, particularly the fried variety that arrives between buns, biscuits and English muffins. There are non-chicken items—breakfast sandwiches and avocado toast—but fried chicken sandwiches here are what you should be focused on. 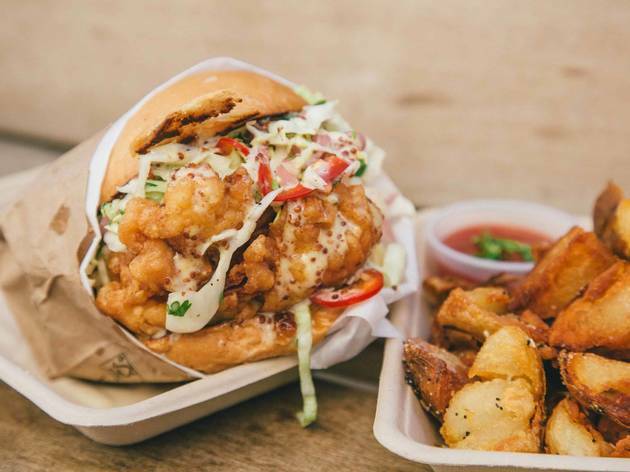 To start, try the Original Free Range LA Chicken Sandwich, made with tempura fried chicken, fresno chili coleslaw, and whole grain honey mustard sauce on a toasted Portuguese bun. Look, these guys make a mean fried chicken sandwich. That's all there is too it. It's good. Their brick-and-mortar location at Universal City Walk is an oasis in a dessert of low-concept, high-kitsch chains like Bubba Gump's. I want to knock Free Range for being a social media fixture—you know, those low contrast photos of its paper-wrapped sandwiches—but that wouldn't be fair. 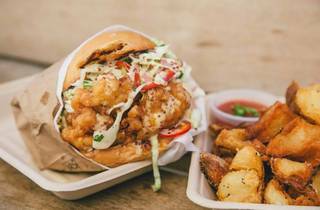 The food is good; the original chicken sandwich's tempura fried batter keeps the sandwich from being too heavy. Make sure to grab a side of crispy potatoes.